Get into a festive mood with the Something to Celebrate cartridge! 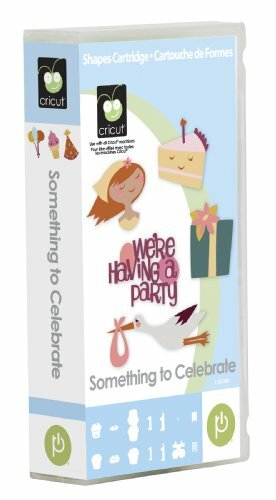 This cartridge is filled with cute party-themed images that are perfect for the celebrations in your life. The cards, boxes, bags, cupcake wrappers, and tags are perfect for any occasion. Use the latest Cricut® cartridges to create unique and engaging designs for every occasion. The versatility of the cartridges will surprise even the most imaginative crafters. Warranty Provo craft warrants that each cartridge is free from defects in materials and workmanship and will perform substantially as described. The warranty period for the cartridge is 90 days and starts on the original date purchased. See packaging for further details.